Nieto Sobejano Arquitectos have completed a few museums this year - see them all here, including another one that tunnels underground. The ground surface, the horizontal platform upon which most of our movements in the city occur, is very rarely the generating argument or the spatial support of a project. Perhaps as a result of that yearn for an identity that every new intervention seems to demand, architecture has tended to express itself throughout history by means of objects, volumes that have often established a difficult relationship with the scale of the urban environment in which they were inserted. In contrast, the extension of the Joanneum Museum emerged from the intention of acting within the strict limits of the horizontal plane of the city, offering a new public space based on an architectural proposal that is paradoxically simple in its depth and complex in its surface. 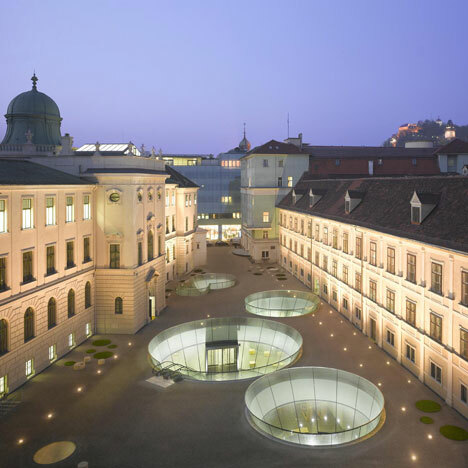 The Joanneumsviertel of Graz is formed of three buildings of different periods and uses that up to now gave their back to one another and towards a residual rear courtyard: the Museum of Natural History – from the 18th century –, the Regional Library of Styria and New Gallery of Contemporary Art, the latter built at the end of the 19th century. As organisms belonging to the same institution, the project set out the need to endow the complex with a common access, welcoming spaces, conference hall, reading areas and services, aside from a lower level for archives and storage. Instead of falling into the temptation of developing an iconic intervention, as has often happened in recent extensions of existing museums, the project meant, however, a unique opportunity to carry out an at once urban and architectural transformation. If the historic center of Graz is known for its expressive roofscape, our proposal develops entirely below ground: we simply define a new pavement that as a large carpet takes up the whole exterior space between buildings and conceals below ground the spaces that house the required program. This decision allows acknowledging the value of the existing historical constructions – carrying out a refurbishment that is respectful towards their architectural characteristics – which acts only punctually in some interior areas without affecting the original exterior image and volume. The horizontal continuous surface of the new square is marked by a combinatorial series of circular patios that bring natural light into the underground spaces and house the entrance, the lobby and shared areas of museums and library, a gathering place from which to reach each one of them. The geometric abstraction implicit in every architectural work appears in the proposal with the boldness of a contemporary installation in the public space, transformed into an apparently random sequence of conical intersections derived from a single, virtual three-dimensional figure. Curved glass surfaces with a continuous silkscreen print filter light towards the interior and, inversely, illuminate the square with artificial light at night. A cultural institution like the Joanneum Museum, on which the Kunsthaus Graz is dependent, thus expresses the changing relationship between art and city. The square that centralizes the access to the museums is an unusual intervention in the urban space: a bet on the common action between plastic arts and architecture that will incorporate specific installations in collaboration with contemporary artists. The new extension goes almost unnoticed, concealed beneath the pavement that connects the historical buildings, as a materialization of a perforated horizon that expresses, and not only literally, that the depth of an architectural work can reside, unexpectedly, on its surface.